TORONTO, November 8, 2018 – Dancing Doll, an Ontario-bred two-year-old daughter of Artie Schiller, makes her stakes debut in Sunday’s $100,000 Glorious Song, at Woodbine. Bred and owned by James Perron Racing Stable, Dancing Doll heads into the seven-furlong feature in winning form, a maiden-breaking score coming on October 21 at the Toronto oval. Under Ademar Santos, the bay filly seized control of the six-furlong main track tilt by the quarter-mile mark and went on to win by 1-1/4 lengths under a hand ride. Now, Dancing Doll, who has one win, two seconds and a third from five career starts, will step up to the stakes stage for trainer Nick Nosowenko. Dancing Doll will face four rivals in the Glorious Song, including the Mark Casse trio of Devious Charm, Si Si Tequila and Souper Charlotte. The Glorious Song has been music to the ears of the Hall of Fame conditioner over the years. He’s won seven runnings overall and has taken four of the past five editions, including in 2017 with Win the War. Nosowenko hopes his filly can show plenty of bite this Sunday. He’s looking for Dancing Doll to bring that competitive spirit to the Tapeta this weekend. The Glorious Song is slated as race eight (approximate post time of 4:42 p.m.) on Sunday’s 12-race card. First post is set for 1 p.m. 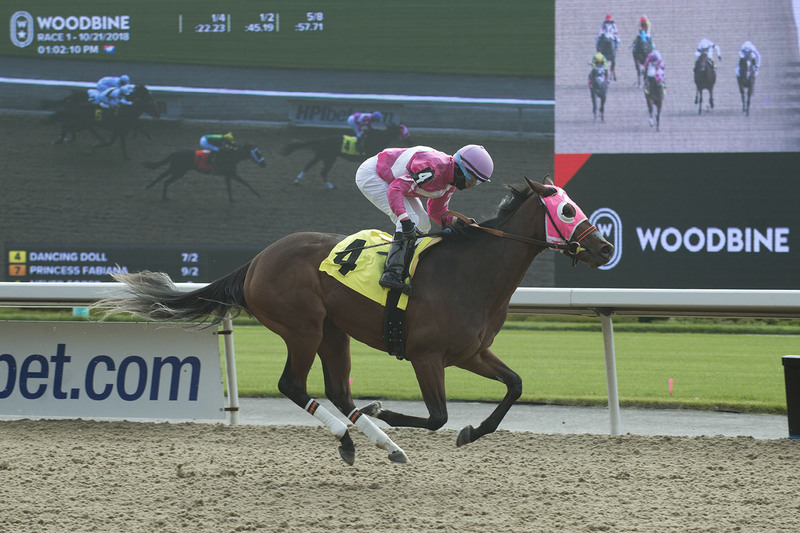 This entry was posted in Woodbine News and tagged Dancing Doll, Glorious Song Stakes, Horse Racing, Nick Nosowenko, Woodbine. Bookmark the permalink.